Ever wondered how other players can get so much awesome enchanted gear in such little time? Struggling to gain experience orbs and need an efficient way to do so with very few casualties? In this tutorial, we will be going over how to build a quick XP farm with a zombie spawner (though any spawner will do). Working with the spawner you found, you will need to begin the setup process. Keep in mind that it is very unlikely that your spawner room will look exactly like mine. It's just how Minecraft works! Don't let that frighten you, as you will still be doing the same steps I did, regardless. A good setup is making sure the room your spawner is in is 7x5 blocks in size. The 5-blocks long side will be the sides to your spawner, and the 7-blocks long side will be the front/back of your spawner room. Behind your physical spawner, make sure you have 3 blocks between that and the wall. Same goes with the sides—you will need 3 blocks of room on either side. 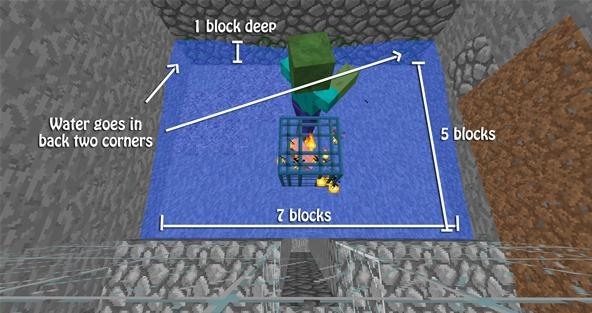 When it comes to the front of the spawner, you will only need 2 blocks in front. Only one row of these blocks will have water on them. The other will be your glass wall, as well as the 7-blocks deep hole where mobs will drop down. You will now want to make a hollowed out area down below your safe zone. This room can be as big or as small as you want, as it won't make a difference. You need to have the floor dug down 2 blocks under where the zombies drop down. This makes it easy to get under the iron bars and hit the zombies without you receiving damage from them. 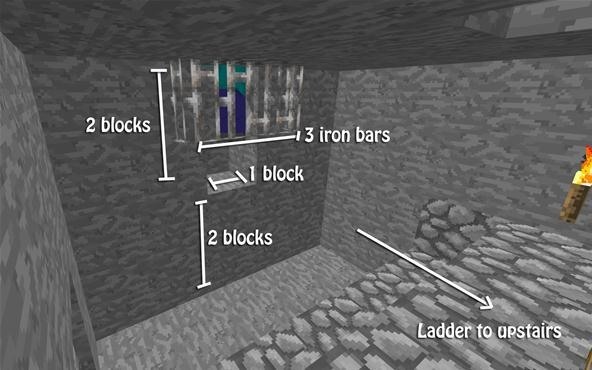 3 iron bars will be placed just like it's shown in the picture below. You are now all set to let your spawner do the work for you. You can build around the area that your spawner is at, or simply sit in the same spot while they spawn. Once you have enough zombies spawned (30-40 minutes), you can go ahead and start killing them! Do you have experience with creating mob grinders? How do you normally go about setting up your XP grinder? What if you had the same thing, except had the water flow through the hole that drowned the zombies? Would that work of would the orbs dissappear? Yeah, drop XP farms work well! You just make it so they drop down 23 blocks. Once they fall, they will have 1 half of a heart left. You can then just hit them with your fist once to kill them. 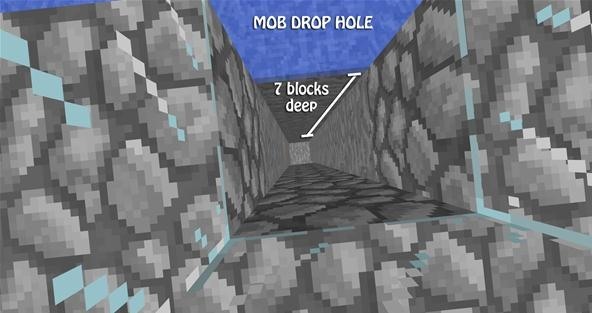 If they drop any more than 23 blocks, they will fall to their death and you can't get their experience! I miss the old passive mob grinders. Sorting them with water tubes was really fun. Ya if they die naturally you don't get xp. If you wanted just loot then you could drown or pound them. I have a problem.. I want to see them spawn but for that I need light and a glass wall. LIGHT GOES THROUGH GLASS! If I Put the glass wall and light to see by the zombles won't spawn will they? Here is an idea! Make a wall of stairs facing perpendicular to where you want to see them. maybe you can build a one by one by 3-5 tunnel and put a torch on the end of that to provide enough light to see? Why is it a pig spawner that is spawning zombies? In 1.1 Multiplayer, the spawner shows as a pig. Even if the spawner is really a zombie, spider, skeleton - it still shows as a pig. They fixed this in 1.2 though! AMelia silverbug, redstone torches only put out 9 light units, so that will not stop the zombies spawning, and give you plenty of light to see by. On the safe side, just make sure you place your regular torches 5 or more blocks away from the glass to allow the zombies enough darkness to spawn. Good luck! good idea! 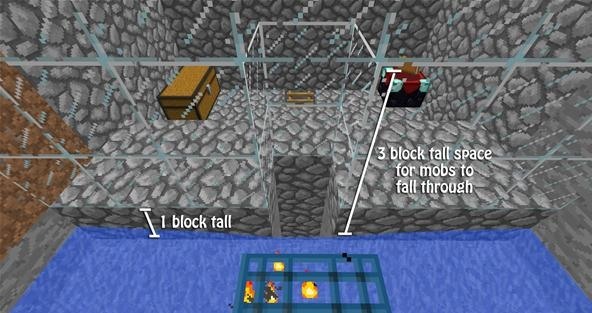 could you make some more ways to kill mobs? i cant get xray? can someone help me? plese? I should add that you are NOT allowed to make XP machines on our server. They slow everything down for everyone, and can potentially result in a ban. So feel free to use this on your own servers, but not at mc.wonderhowto.com. This is unimpressive. 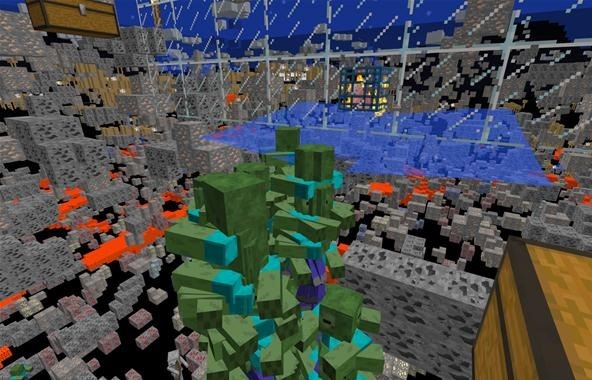 For maximum zombies spawner area should always be as close to 9x9 as possible.